Harare - Cameroon and Zimbabwe do not share borders - but their similarities are plenty. The southern African nation was ruled by a single president - Robert Mugabe since independence in 1980 - until his ouster in November 2017. 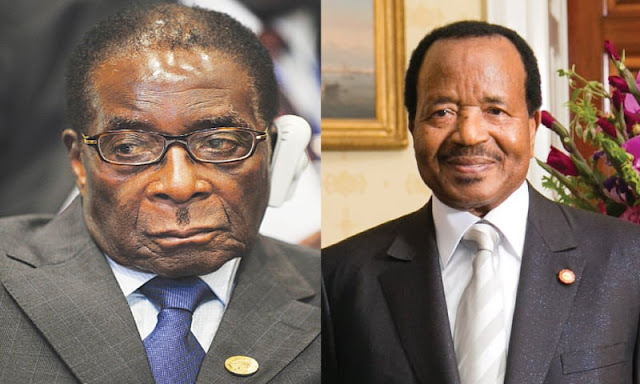 After this episode, Paul Biya assumed the current throne as the longest-ruling leader (Prime Minister and President) in Africa and the oldest ruler in Sub-Saharan Africa after Mugabe stepped down during the 2017 Zimbabwean coup d'état. Cameroon President Biya will seek another term to prolong his stay spanning from November 6, 1982 - and just like Mugabe, the duo ran their states with an iron fist - leading to pockets of resistance within their respective states. And now the two nations face a similar predicament: cholera. In 2008 - at least 5 000 lives were lost in Harare due to the water-borne disease - with 100 000 treated at different hospitals. According to ReliefWeb, a cholera outbreak in Cameroon has claimed at least a dozen lives and sent hundreds of people, many of them children, to hospitals since May. The World Health Organisation says cholera is primarily linked to insufficient access to safe water and adequate sanitation. One of these products, meant especially for hard-to-reach rural areas of developing nations, is a portable crank-operated machine capable of taking water from a polluted source such a river and purifying up to 500 liters per hour – enough to supply all the daily water needs of 300 to 400 people. In Zimbabwe, the severity of the 2008 outbreak, last recorded a decade earlier, was attributed to poor access of health care, poor health infrastructure, high HIV prevalence, political instability, food shortages, high levels of displaced people and lack of access to safe water. High inflation triggered severe basic food shortages, collapse of service delivery and large volumes of refugees moving within the country and to neighbouring countries amplified the rapid spared of cholera. Raw sewage from burst and aging municipal pipes contaminated urban domestic water system, creating a national catastrophe.